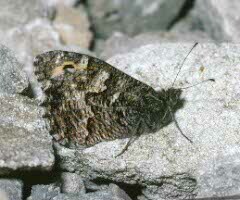 Grayling is found in a few places in two very different types of habitat in our area. 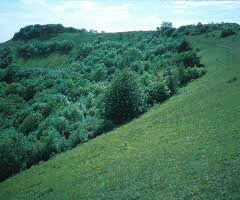 It is a grassland species which needs a hot habitat with a lot of bare earth or rocks. There are a few colonies on Cotswold scarp grasslands. These have some similarity with the coastal clifftop habitat used by the species elsewhere in Britain. 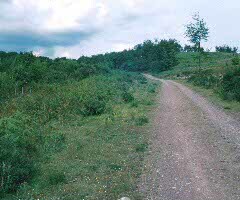 The other colonies are in the Forest of Dean where the Grayling uses old industrial sites: former railways, open-cast coal mines and spoil heaps. It has also been found on heathland, a habitat which is currently being restored in some places in the Dean area. In summer droughts, Graylings may leave their colonies in search of nectar. They have been recorded a few miles away, in town gardens. Scrub and tree growth can shade out Grayling habitat. The species may have been lost for this reason, or perhaps through reduced rabbit-gazing of the steep grassland, on one of its Cotswold edge sites within the past five years. 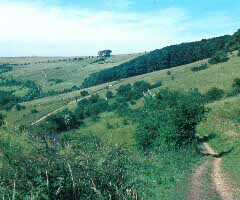 Similarly, vegetation gradually increases on some of the former industrial sites in the Forest of Dean, and the number of Grayling sites there has reduced. 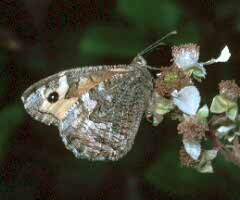 The Grayling's habit of resting on bare, rocky soil means that the butterflies may take advantage of some of the many cycle-tracks which have been built in the Dean along forest paths and old railways. If so, they risk being run over! From about mid July to late August. Two or three areas along the western edge of the Cotswolds, and several colonies scattered across the Forest of Dean area.